Spreading the Easy Way with the RO-M EW weighing spreader. The RO-M EW (Easy Weigh) is the ideal weighing spreader for the smaller grower! This ISOBUS compatible weighing spreader is equipped with a unique reference sensor, which will correct automatically on slopes and for shocks. Therefore this spreader can work with high accuracy on rough terrains and in hilly conditions. Speed related spreading, with auto calibration, will help to prevent over and under dosing which will result in better yields and saving of fertiliser. For even more comfort, it is possible to use the spreader in combination with GPS. With GPS controlled spreading the Vicon RO-M EW has 2 sections and automatic start/stop on headlands based on the GEOPOINT. It is even possible to do variable rate spreading according to application maps. The Vicon RO-M EW can be operated with the IsoMatch Tellus PRO, IsoMatch Tellus GO or any ISOBUS compatible terminal. Highest accurracy in all conditions: even spreading quality guaranteed! Save costs and increase quality: spreading the Easy Way! * Depending on fertiliser type and type of vanes. No impact, no fragmentation, no dust: Central release point, smooth acceleration and centrifugal force accelerates fertiliser up to disc speed before it reaches the vane. Accurate spreading pattern: A double overlap spreading pattern gives unrivalled accuracy. The 8 vanes per discs are ensuring a continous flow of fertiliser to the field. This is important for high capacity spreading and forward speed. Minimal wind influence, maximum tolerance: Flat discs and a horizontal flow of fertiliser give a symmetrical spreading pattern. Consistent spreading pattern: Eight vanes per disc, eight sectors per revolution give an equal distribution. Double overlap spreading pattern. Guaranteed accuracy on slopes: guaranteed accuracy on slopes. The fertiliser always contacts the vanes at the same point, also on slopes and travels the complete length of the vane. Continuous dynamic "online - calibration" with high frequency communication signal. 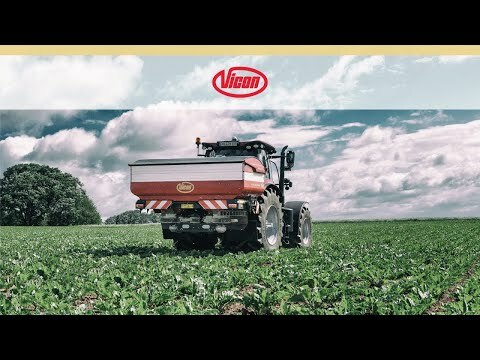 Vicons unique reference sensor technology: all negative influences are automatically corrected and eliminated, ensuring utmost spreading accuracy even on hill sides. 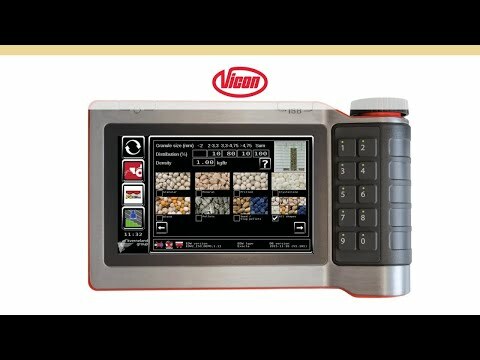 The Vicon reference sensor gives you absolute accuracy, because every kilo counts! Highest accuracy in all conditions: even spreading quality guaranteed! Save costs and increase quality! The compact FlowPilot 'dashboard' gives you considerably simplified accurate setting and adjustment of applicaton rates. Two hydraulically operated metering plates, each with three discharge openings ensure an equal fertiliser flow from the hopper to the spreading discs. The R&D department of the Vicon spreaders has its own spreader competence centre in order to allow continuous testing throughout the year. All test are carried out according to the strictest international standards and quality requirement. Vicon offers the TrimFlow system or manual/hydraulic border spreading plate for border spreading. The TrimFlow can be accurately set for all types of fertiliser and for all working widths. Operation is easy, no need to leave the tractor seat. For the RO-XL, RO-EDW and RO-XXL models the TrimFlow can even be fitted on the left and right hand side of the spreader. With one-side boundary spreading the tractor is driven approximately 2 metres from the field border. With boundary track spreading the tractor is driving in the first tramline and is spreading to the border. The distance to the border is the half of the working width. The Border Spreading Indicator (BSI), indicates which border spreading device is active. With the IsoMatch MultiEye you can connect multiple cameras to the IIsoMatch Tellus or IsoMatch Tellus GO Terminal. You can easily switch between the cameras without the need for an additional screen in you tractor cabin. It gives you full control and overview of the entire machine operation during day and night, because of its night vision by integrated LED’s. This increases the safety when reversing the machine or manoeuvring around obstructions. IsoMatch GEOCONTROL is an additional software application within the IsoMatch Tellus and IsoMatch Tellus GO that helps you to control all ISOBUS compatible Kverneland Group machines such as sprayers, spreaders and seeders! Combined with a GPS receiver it fulfils the future needs in terms of easy, smart and efficient farming. More efficient work and avoiding overlap leads to cost savings of 5-10% on fertiliser. Better growing conditions and increased yield.